As part of the celebration, Metro will offer free rides on Expo the weekend it opens, Saturday and Sunday, April 28-29. Just a reminder that Expo is the only Metro rail line that will be free. Here’s the release, just issued. Note that it includes limited hours for opening weekend, and that two stations — Farmdale and Culver City — will not open until this summer and, therefore, that trains will not be stopping there to pick up or drop off passengers. To kick off the opening of the new Metro Expo light-rail line, Metro will offer free rides on the Expo Line during opening weekend Saturday and Sunday, April 28 and 29. The free rides will be limited to only the new Expo Line that will operate on a limited schedule during the opening weekend from 5 a.m. to 7 p.m. on both Saturday and Sunday, April 28/29. Patrons using other Metro operated trains (Red/Purple, Gold, Green & Blue lines) and Metro buses will pay regular fares. 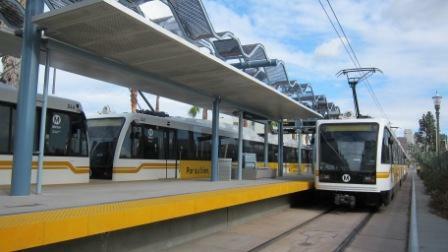 The opening of the new Metro Expo Line expands the Metro Rail system to nearly 90 miles. Stations opening April 28 include two existing stations served by the Metro Blue Line (7th Street Metro Center Station and Pico Station) as well as new stations that will include 23rd Street, Jefferson/USC, Expo Park/USC, Expo/Vermont, Expo/Western, Expo/Crenshaw, Expo/La Brea and La Ciengea/Jefferson stations. Due to on-going construction activities, both the Farmdale Station adjacent to Dorsey High School and the Culver City Station will not open until this summer. Metro Expo trains will stop at the Farmdale station but patrons will not be allowed on or off at that location. Trains will travel as far as the La Cienega/Jefferson Station only. In addition to the free ride on the Metro Expo Line, several community events are planned for Saturday, April 28 from 10 a.m. to 4 p.m. Those community events will be held at the 7th Street Metro Center Station in downtownLos Angeles, Expo Park/USC Station, Expo/Crenshaw Station and the La Cienega/Jefferson Station. No community events are planned for Sunday, April 29. Fares for the new Metro Expo Line following the free weekend rides will be the same as all Metro-operated bus and trains costing just $1.50 one-way (cash) or patrons can purchase a Metro Day Pass for $5. Regular Metro monthly passes also are available for $75 good for unlimited travel on all Metro buses and trains. For more information visit metro.net/expo. Will parking be free as well? Do you know what kind of opening ceremonies/ribbon cutting we might see and where and when we might see it? There will be community activities and ribbon cuttings but details are still being firmed up. We will know more next week and let everyone know in time for the celebration. Thanks for asking. Why do the rail cars look like ones out of the 1980’s? You would think we would upgrade to ones that look more modern for the price we are paying to construct this new line. If one gets on the Expo Line and transfers to the red line will they have to pay? I understand paying on the way back but how can metro deal with all of the people originating on Expo but transferring to the other lines? Funds are only allocated to build and lay new tracks, not buy new railcars. Metro has no money to buy new trains as it is not a for-profit enterprise; they have to make use of older trains on new track, akin to driving a 1980s Toyota on a new freeway. If you want new trains, they will gladly accept your contribution in forms of higher taxes, higher fares, or service cuts to make up for the revenue. Alternatively, they can lean toward being a for-profit enterprise to reduce taxpayer burden instead of being forever chained to taxpayer dollars. What about when paid service starts on Monday, 4/30? I’m finding it difficult to find any actual information about Expo being a reality. It’s not an option on the Trip Planner, it’s not listed with the other rail lines…will it still be limited service or open later come Monday? We’ve only known this was coming for years and the only information is about the free weekend. I just can not wait for the opening of the expo line. I have been at all the opening of the Blue, Red/Purple, and Gold lines. I am looking foward to the opening of this line. I’d like to go, but I can’t figure out where? Metro is beginning the procurement process for its next set of railcars. (See: http://thesource.metro.net/2012/04/12/light-rail-car-contract-to-be-considered-by-metro-board-at-special-meeting-on-april-30/ ) Railcar procurement is generally planned to ensure the fleet will large enough for planned rail extensions but is often funded from different pots of money than are rail capital projects. As far as the Expo Line, it is functionally a branch of the Blue Line and both will operate using the same vehicle fleet. Expo Line schedules have already been posted to Google Transit, so you can plan trips using the Expo Line there. I personally don’t know if/when Metro’s trip planner will be updated. Where will the transfer be from the Blue Line to the Expo Line? At Pico? Will we have to tap our TAP cards again to board the Expo Line? If so, will there be enuf TAP machines to tap our cards a 2nd time? Will we have to walk to the end of the platform then back again? Will there be electronic signs or PA announcements indicating which train is arriving at Pico? It’s not always easy to see the head signs. Different pot, same source. Bonds, federal funds, state funds, local funds, props, etc. call it what you want; bottom line, it’s the same thing: taxes. And the more reliant Metro is on taxes, the long term costs will be damaging, inevitably digging into the same pitfalls as the NYMTA and Boston’s MBTA. Alternatively, Metro can learn from their mistakes and instead follow the Asian model of mass transit: leaning towards a for profit business enterprise that is less reliant on taxes. The ride may be free on opening weekend, but I’ll still buy a day pass. The transit system needs plenty of money and affordable transit oriented development to live up to its true potential. Take that money and keep building Metro! I think that the entire Metro system should be free for nine days (two weekends and a work week) to get people hooked into the Expo Line. Hving just the Expo Line free for only one weekend cannot draw the crowds in effectly because people still need to take a bus or train to get there, and people need to compare the travel speeds between the Expo Line and the alternatives during rush hour. I’m wondering about the limited hours. Is that limited hours of Expo operation, or that Expo will only be free during those hours, but outside them Expo will run but require standard fare? As usual, Metro management provides totally inadequate information to the public, preferring just to “puff” the supposed achievements of the organization rather than actually to try to provide concrete, information that would be of some use to the transit-using public (who, after all, are the ones paying the bloated salaries of Metro management). As but one example of this uncaring behavior by Metro, why was there no link to a map of the newly built line, so the interested public actually could see where the stations are (and which ones WILL NOT be open)? And they wonder why most residents of this area would rather use their cars. So how many months late is this belated partial opening of just a part of the long-touted Expo Line (with two stations still not going to be open until who knows when). The free rides will be limited to only the new Expo Line that will operate on a limited schedule during the opening weekend from 5 a.m. to 7 p.m. on both Saturday and Sunday, April 28/29. I love the idea of a free weekend on the light-rail system, except that with little to no enforcement, I often feel that I am the only one paying to ride. A day pass is $5. That is so much less than a drive on the 405 to Hollywood or Los Felis or anywhere else. Parking once you get there by car is $10 +. Even though this weekend is free, please buy a pass anyway. This resource has such potential, but people abuse the open system at the rail stops and don’t pay their fair share. Just a reminder to everyone: Rides are free only on the Expo Line this weekend! Other Metro rail and bus lines require a fare.